Home / Blog / Celebrate Apple Season With These Caramel Apple Delights! Satisfy your sweet tooth this apple season with these gourmet caramel apple treats! The delicious combination of crisp, ripe apples and creamy, gourmet caramel are a treat that cannot be passed up. With Wockenfuss, you have many options when it comes to caramel apples. If you like to keep it simple, there’s a classic caramel apple for you. For those who are looking for something a bit more exciting, we’ve got some caramel apples that are outside the box as well. Satisfy your sweet tooth this apple season with these gourmet caramel apple treats! If you go for the simplicity of creamy caramel and a crisp Granny Smith apple, Wockenfuss has exactly what you need. For traditionalists who enjoy nuts, there are regular caramel apples that are coated in either peanuts or pecans. 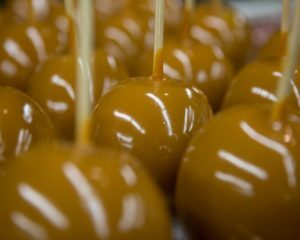 There’s nothing wrong with sticking with what works, and this apple season, you can treat all of your loved ones to Wockenfuss’ plain or nut-covered caramel apples. If you love caramel apples and you also love chocolate, there are many caramel apple options for you to fall in love with this season! For dark chocolate lovers, a classic caramel apple dipped in dark chocolate is ideal. For those with a sweeter chocolate preference, try the milk chocolate caramel apple. Who doesn’t love Oreos? Oreo-lovers will enjoy these delicious crushed oreo cookie-coated caramel apples! Peanut butter lovers will go crazy for caramel apples that are dipped in milk chocolate and freshly chopped peanuts, then topped off with a drizzle of both milk chocolate and peanut butter. Looking to add a bit of the tropics to your fall sweet treat? A toasted coconut white chocolate caramel apple is the perfect snack for you. Apple pie lovers, look no further. After drenching a Granny Smith in our luscious creamy caramel, we then we dip our apple pie caramel apples in white chocolate and sprinkle them with cinnamon sugar. It’s so good – even better than eating apple pie! GET READY FOR FALL WITH WOCKENFUSS CANDIES! This entry was posted on Thursday, September 20th, 2018 at 11:05 am. You can skip to the end and leave a response. Pinging is currently not allowed.